If you are looking for a cutting-edge qualitative text, search no more! Help your students broaden and update their ideas about qualitative research. Offer learning experiences that help them learn how to reach across the globe– or across town– to collect data with visually-rich, interactive online interviews. Find teaching materials including syllabi, videos and worksheets here! Methods training in the UK! The Virtual Book Tour is on the Move! 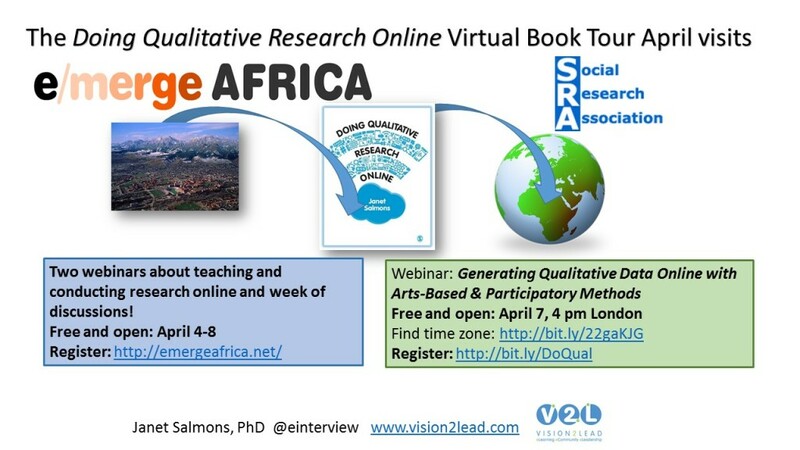 The Doing Qualitative Research Online Virtual Book Tour includes stops across the globe. If you’d like to host a stop on the virtual book tour, learn more here and contact me. Haven’t purchased a copy? Get a discount with this coupon. Maynooth University in County Kildare, Ireland! The first stop on the Doing Qualitative Research Online Virtual Book Tour was the Advanced Digital Research Methods class lead by Aphra Kerr of the Sociology Department in Maynooth University, Ireland. We discussed “Eliciting Data with Online Interviews or Focus Groups.” This class is part of their MA in Sociology (Internet and Society) course.Further information on the course can be found here and you can visit Aphra’s webpage. She is on Twitter at @aphrak and the Department is @MU_Sociology. University of Stirling in Glasgow, Scotland. I visited the Theory and Methods of Digital Social Research class at the University of Stirling, in Glasgow,Scotland. It is great to exchange ideas with bright and curious students who are looking at the possibilities for using digital methods in social research. 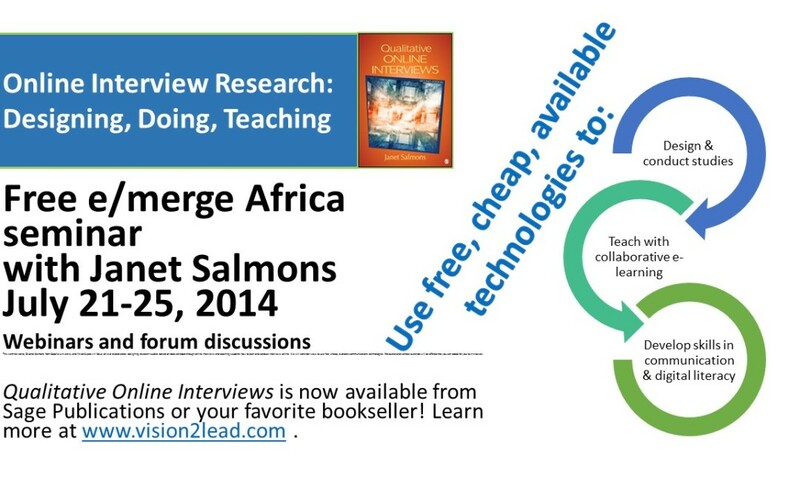 A week-long series of events for educators and students across Africa, through e/merge Africa! Log in to E/merge Africa and access archived materials and recordings. I presented one webinar for faculty who teach research methods or use research activities in their courses: “Getting Started: Teaching Online Research Design Basics.” I presented a second webinar for researchers, “Enacted Approaches for Generating Data with Arts-Based & Participatory Methods.” This webinar focused on the use of creative, interactive online methods. Social Research Association, based in London. We discussed creative and arts-based methods. I created a short exercise guide for visual techniques you can use with your group or class. This session included both an overview of online methods and a focus on eliciting data with interviews. “Online Research: Holistic Thinking and Qualitative Design” Learn how technology can influence all aspects of the design, whether you collect extant data, elicit responses from participants in online interviews, or generate data with arts-based methods. Contact me to be a part of the tour! I can visit your group of researchers, research faculty or consultants, and/or students. Learn how to incorporate research activities into your online or blended class. Join me for a free webinar: Getting Started: Teaching Online Research Design Basics – Monday 4 April 2016 – 3 pm (SAST) Find your time zone here. 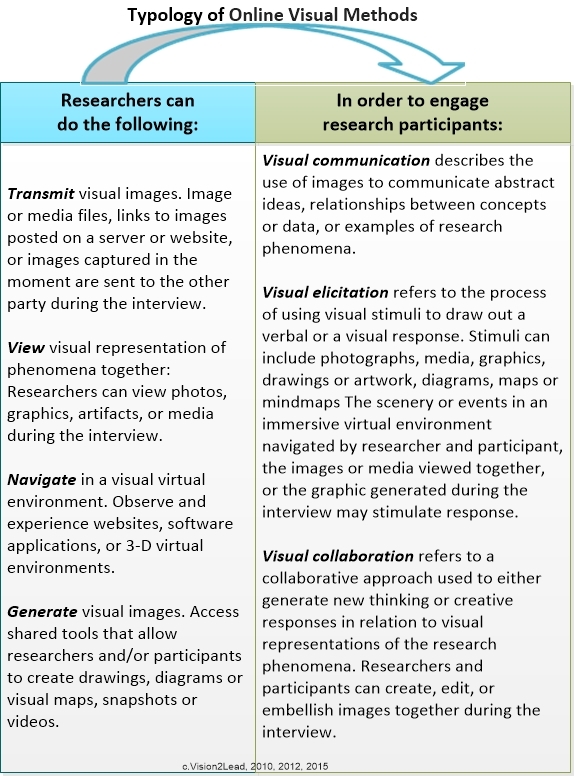 Students in research methods classes benefit from the experiential activities that invite them to develop and practice skills associated with qualitative methods, such as interviewing and observing individuals and groups. 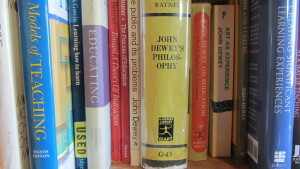 Students in other curricular classes, including business or NGO management, sociology or education, benefit from research activities that invite them to bridge theory and practice by learning from practitioners or members of the community. Inquiry models of teaching allow us to create meaningful learning experiences online, for e-learning or blended learning classes. Few textbooks have journeyed with me over multiple cross-country moves from student days at Cornell University to my current bookshelf. Models of Teaching is one I kept, and then updated to a more current edition (Weil, Joyce, & Calhoun, 2009, pp. 86-87). The models that have intrigued me all these years focus on creating communities of learners through engaging social-learning approaches. Yes, you could say their work represents a social constructivist perspective. And while I have given a lot of thought to social constructivism in the online world (Salmons, 2009, 2015), here I want to look specifically at inquiry models of teaching and how we can use them online to build deeper levels of comprehension. Focus: Concentrate on an area of inquiry they can master. Conceptual control: Organize information into concepts, and gain mastery by distinguishing between and categorizing concepts. Converting conceptual understanding to skills: Learn to build and extend categories, manipulate concepts, and use them to develop solutions or answers to the original questions. Focus: Assignments can begin with a research plan or design- what information is needed to answer what question? What are the parameters for this assignment, including time constraints? Conceptual Control: Approaches to gathering information can include online interviews with practitioners, experts, or individuals with experience in the topic at hand. Assignments can include observation of online activities, including social media, communities, and posted discussions. Or, assignments can include research and analysis of documents or visual records available online or in digital libraries or archives. Once information and data has been collected, participants organize, prioritize and describe relationships between key ideas. Converting conceptual understanding to skills: The above activities are of little use unless students can synthesize and make sense of what they’ve studied. What can they do with what they’ve learned– either to further academic study or to develop practical solutions using these new findings? A first step may be a discussion that where individuals or teams share what they’ve learned and invite new insights from others in the class. At this point they may identify new questions or topics for future inquiry. Why are inquiry models important today? Educators engage learners when learners are engaged in true inquiry. In the digital age we overwhelmed with information, some of it vetted by editors or reviewers, but much of it made freely available by anyone with a point of view and a smart phone. It is ever more important to develop the skills needed to focus on specific questions and discern relevant and credible evidence as needed to address them. Research activities invite students to build critical thinking skills at the analysis and synthesis level of Bloom’s Taxonomy. Whether students or participants are preparing to be scholars or professionals, research skills are essential and modern life. By integrating research experiences into content courses across the curriculum (rather than offer them in methods classes exclusively), students can learn to research and research to learn. Where can I learn more? 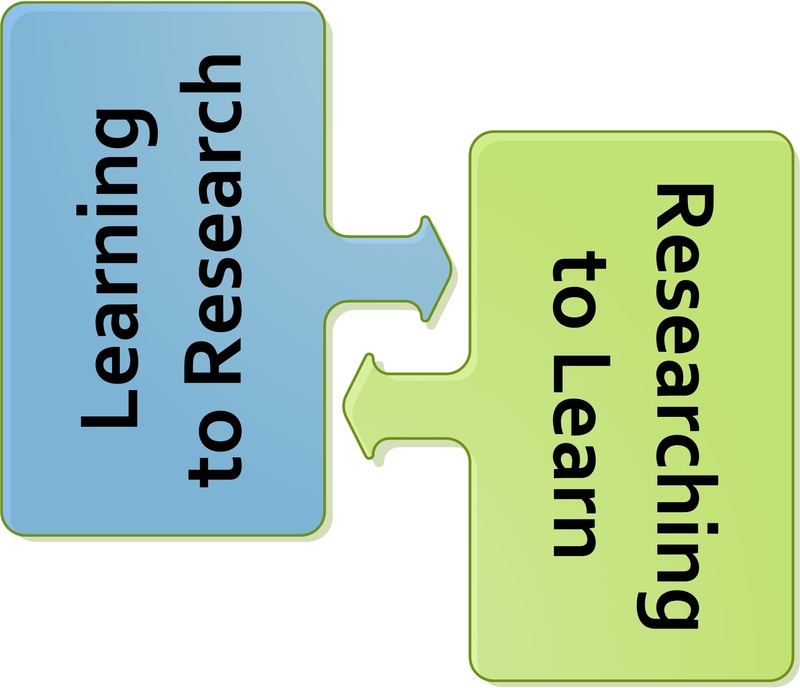 Join me for a free webinar: Learning to Research, Researching to Learn on February 5. Enroll here for the Connecting Online for Instruction and Learning Conference to participate in this and other sessions with educators from across the globe. See Doing Qualitative Research Online (2016) and Qualitative Online Interviews (2015), and companion websites, for more assignment suggestions you can adapt to your class. Bloom, B., Engelhart, M., Furst, E., Hill, W., & Krathwohl, D. (1956). Taxonomy of educational objectives: Book 1, Cognitive domain. New York: David McKay and Company. Salmons, J. (2009).E_Social_Constructivism_and_Collaborative_E_Learning. In J. Salmons & L. A. Wilson (Eds. ), Handbook of research on electronic collaboration and organizational synergy (Vol. II). Hershey: Information Science Reference. Salmons, J. (2015). Qualitative online interviews. Thousand Oaks: Sage Publications. Salmons, J. (2016). 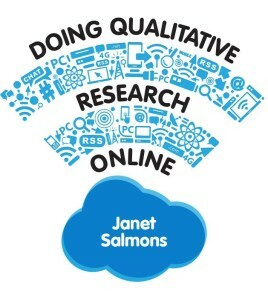 Doing qualitative research online. London: SAGE Publications. Weil, M., Joyce, B., & Calhoun, E. (2009). Models of teaching (8th ed.). Boston Pearson. Find assignment ideas here. Find a discount coupon for purchasing Doing Qualitative Research Online here. For news on future webinars, subscribe to Vision2Lead News or follow me on social media. 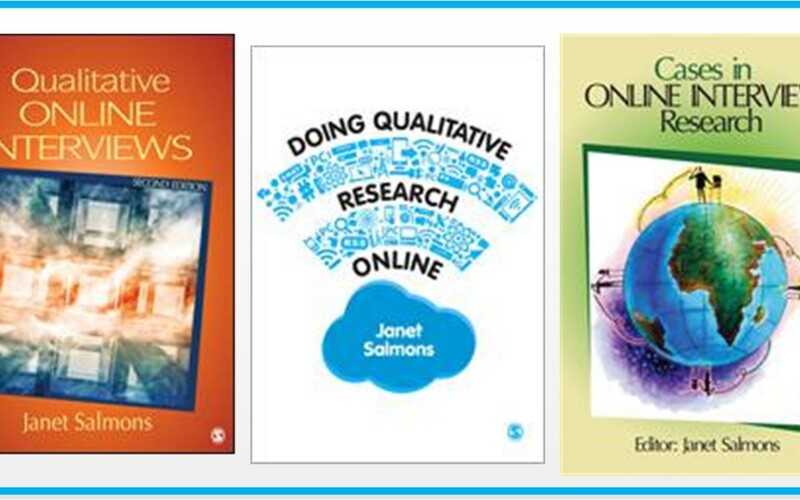 Doing Qualitative Research Online is now available for order from SAGE Publications! Use this book to think through the options and ethical implications for designing and conducting your own online research using extant, elicited or enacted approaches. Or teach it, and update your research methods course materials. The companion site includes syllabi, articles, media and lots of assignment ideas. In May I will be offering both full-day training sessions (fee) and half-day seminars (free or discounted for SRA Members) with the Social Research Association in the UK and registration information is now online! The sessions will be interactive, experiential and substantive. They are appropriate for qualitative researchers and those who teach and supervise research. May 6: Full-day training in Edinburgh: Digital Methods for Qualitative Research. This session is now full! May 7: Half-day seminar in Edinburgh: Getting to YES in the Digital Age: Informing Participants and Verifying Their Consent. May 8: Presenting at the Creative Research Methods conference in London: Seeing the Question, Showing the Answer: Visual Online Interviews. May 11: Half-day seminar in London: Getting to YES in the Digital Age: Informing Participants and Verifying Their Consent. will be joined by Matt Williams, founder of COSMOS, the Collaborative Online Social Media Observatory, and the session is chaired by Kandy Woodfield, NatCen Social Research and New Social Research, New Social Science. May 12: Full-day training in London: Digital Methods for Qualitative Research. 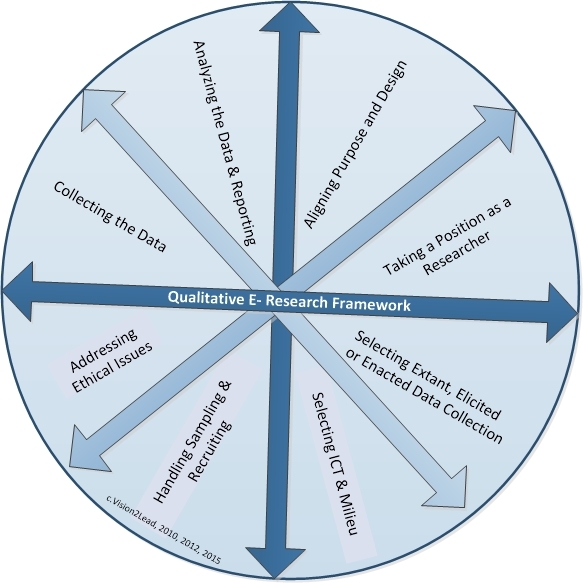 The Qualitative E-Research Framework and Typology of Online Visual Methods provide holistic, systems-thinking approaches to considering choices in the context of research design for studies that make use of highly-interactive, visual and mobile communication technologies (Salmons, 2015, 2012). View the recorded webinar here. See sample exercises: E-Interviews for Active Learning in Class Projects. Communications technologies allow us to keep in touch with far-flung friends and family, to work remotely, and to teach and learn online. We probably make different choices for the technology we use when we want to see the new baby across the country, versus when we are trying to finish a report we are writing with a colleague who is in another part of the world. Similarly, when we decide to use online communications technologies for research interviews, we need to make numerous decisions about which mode best supports the goal of the exchange. Then, we need to decide how to go about conducting the interview given that technology– how to create trust, develop rapport, and ask questions that will generate rich answers. Even though we may feel comfortable with our skills to communicate online, doing interviews requires another level of thinking and planning. How do we learn such skills? The availability of online communications tools means we can use e-interviews as experiential learning exercises in classes to achieve curricular goals as well as to develop online research skills. This session will focus on use of online interviews in a) research methods courses to give students practice in planning and conducting interviews and b) in courses on other topics, where instructors want to bring real-world expertise into the discussion by having students interview practitioners. In either case, students are learning scholarly research skills and developing digital literacies in addition to gaining real-world perspectives on course content. Sample exercises will be offered that you can adapt for your own classes. If you are looking for the resources I discussed in the Politics and Ethics of Qualitative Online Research you have come to the right place! A resource list of ethics codes, guidelines and statements that include discussion of online research ethics can be found here. Additional materials are posted here. A collection of “E-Research Tips” are posted here, including one on informed consent with a link to a sample consent agreement.